As the weather warms up in most of the country, DIY retailers Lowe’s and the Home Depot are revving their wheelbarrows, hoping to win consumers over in the battle for lawn and garden. The seasonal push is critical for both companies, as consumers scurry to buy new grills, spruce up pools and patios and reclaim their gardens. In preparation for its Spring Black Friday events, the Atlanta-based Home Depot commissioned research to learn more about what Americans really want from their outdoor spaces this year. Among the survey findings: almost 30% put off projects because they’re not sure where to begin. And younger consumers — specifically Gen Z and millennials — are the cohorts most enthusiastic about outdoor projects. Millennials are especially keen on improving yards to make them safer play areas for kids (32%) and pets (31%). Millennials are also slightly more likely to want to liven up their yards for entertaining (39%) than the younger Gen Z (at 36%.) By contrast, baby boomers are most likely to say they maintain their yards to enjoy them privately, at 69%, compared to 56% of the overall sample. 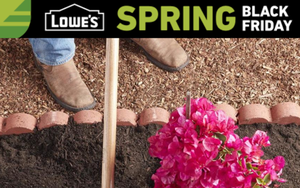 While the Home Depot continues to be the largest home-improvement chain in the U.S., some experts say Lowe’s is on track to outperform Home Depot during the spring outdoor selling season. Between Lowe’s ongoing improvements in merchandising and promotion, Wedbush Securities “favors Lowe’s over Home Depot, given that Lowe’s has about 35% of first-quarter sales in outdoor categories, versus about 30% for Home Depot,” writes analyst Seth Basham.